CADAC is launching its brand new CDC six digital live sound production console at prolight+sound 2015. At a worldwide launch event, at 11:00 on the first day of the show on its stand, CADAC unveiled the CDC six which it claims features the fastest, most intuitive user interface and highest possible audio performance of any audio mixing console available. Based around further development of CADAC’s advanced, highly acclaimed gesture-operation user interface, and the same superlative audio performance and incredible low latency of the CDC eight, the CDC six represents a major ergonomic advance in user operation. Developing still further the innovative user interface debuted on the CADAC CDC eight, the CDC six is far less menu dependent than other digital consoles. The traditional fixed physical controls have been replaced by an intuitive “high agility” user interface, accessed via a widescreen 23.5 inch touch screen resulting in a fast, logical workflow without the compromises dictated by hardware-centric designs. The optically bonded 23.5 inch 16:9 high definition LCD touch screen with digital encoders to the bottom and the right is the most advanced and visually striking feature of the new console. The over-sized touch screen displays the clean, exceptionally intuitive graphical user interface. A unique combination of touch screen and traditional encoders, for additional control of console features, naturally leads to an instinctive use of “touch and swipe”. 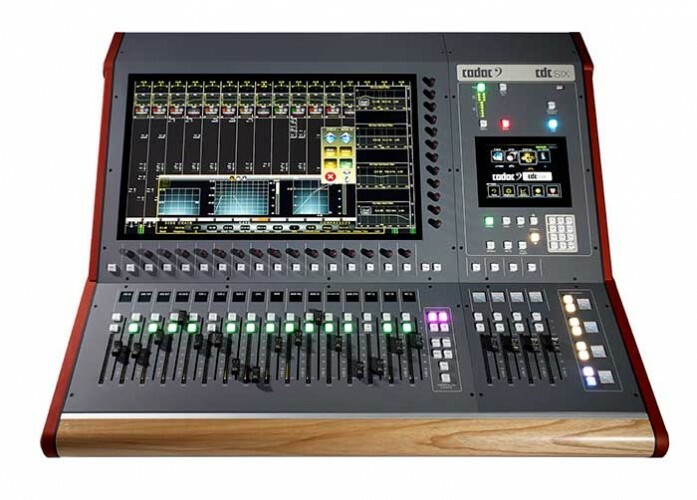 The faders follow the swipe of the screen or scrolling of the channels, ensuring full control at all time of any combination of inputs, outputs or VCAs displayed on the screen. First time users face a minimal learning curve navigating the features by gesture – similar to those for navigating a tablet or smart phone – without a need for any intensive formal training. 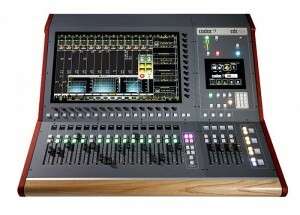 The unique interface capabilities also probably make the CDC six the fastest medium format digital console to setup. To aid operational agility, CDC six features stereo metering conveniently located to the left of each of the 100mm motorised faders, plus an individual full colour OLED display above each fader. The hi-res OLEDs depict the channel name, complete with colour coding, to aid the speed of channel navigation. The OLEDs also denote any VCA assignment of the channel. The additional 6.5 inch LCD touch screen, located to the right of the main screen, provides rapid access to the advanced system controls and automation functions. A 64 input channel, 48 assignable buss design (as Group, Stereo Group, Aux, Stereo Aux or Matrix plus LCR, Monitors and Talkback), with 20 touch sensitive motorized faders, the CDC six features the legendary Classic CADAC mic pre amps, matched with the latest 24-bit / 96 kHz Delta Sigma AD/DA convertors, and sub 0.4 millisecond latency from analogue inputs on stage, through the CDC six, to analogue outputs on stage. There are four AES3 inputs and 4 AES3 outputs, eight fully assignable mic/line inputs and eight analogue outputs. four-band fully parametric EQ, 16 stereo on-board effects, extensive dynamics, input and output delays, snapshot automation, 16 VCA groups, with ‘VCA unfold’ navigation, as well as compressor/limiter, 4-band fully parametric and 31-band graphic EQ on all outputs also feature. In addition to which CDC six (as now does CDC eight) comes with an integrated Waves card for Waves MultiRack SoundGrid server. CDC six also ships with CADAC’s unique Monitor Mode. This feature, found on both the CDC six and the flagship CDC eight, has been developed to tackle the specific requirements of the monitor engineer – too often an after-thought on many of today’s digital consoles. When enabled, Monitor Mode gives the engineer the ability to access any of the 48 user-assignable busses and their respective contribution channels in ‘sends on fader’ mode with a single touch of the screen, making mixing a large number of monitor feeds fast and easy. The incredible low latency also means that CDC six is ideal for in-ear monitoring. Commenting on the most significant aspects of the CDC six from a user’s perspective, CADAC Brand Manager, Richard Ferriday, states, “The combination of an exceptionally fast and intuitive user interface, legendary CADAC mic-pre’s, state-of-the art DSP and FPGA processing technology, with incredibly low latency, make the CDC six a uniquely compelling proposition for those who do not want to be faced with either audio or creative compromises.